In this Indian name, the name Ramanathan is a patronymic, not a family name, and the person should be referred to by the given name, Sarathkumar. Ramanathan Sarathkumar (born 14 July 1954) is an Indian film actor, politician, journalist and former body builder and former president of the South Indian Film Artistes' Association. He has acted in more than 130 Tamil, Malayalam, Telugu and Kannada films. He can speak Tamil, Telugu, Malayalam, Kannada and English fluently. In 1986, Sarathkumar started his acting career in the Telugu film Samajamlo Sthree. He first acted in negative roles, and later played supporting roles before establishing himself as a lead actor in subsequent years, earning him the title Supreme Star in Tamil cinema. He has won two Tamil Nadu State Film Awards and three Filmfare Awards South. In 2007, he launched a new political party All India Samathuva Makkal Katchi (AISMK) in Tamil Nadu, claiming to carry out the ideals of K. Kamaraj. He is the former Member of Legislative Assembly of Tenkasi constituency. He served as the president of the Nadigar Sangam from 2006 to 2015 for three consecutive terms. R. Sarathkumar was born on 14 July 1954 to Ramanathan and Pushpaleela, a Tamil family in New Delhi. His father Ramanathan worked at the All India Radio before joining the Press Information Bureau of India, while his mother Pushpaleela was a housewife. Sarathkumar is the youngest child in his family, he had two siblings; an elder brother, the late Sudarshan Ramanathan and an elder sister Mallika Kandaswamy. His mother Pushpaleela died on 26 October 2013. Sarathkumar started his schooling at the Raja Muthiah High School, after his family relocated from Delhi to Chennai. He then moved on to the Central School in the Indian Institute of Technology Madras, and finished at St. Patrick's Anglo Indian Higher Secondary School. Being an avid sports enthusiast, he played football, cricket and hockey, representing his school and college teams. He also joined the NCC, becoming an Air Wing Cadet. He was one of the cadets who marched in the Republic Day Parade of 1970. After completing his pre-university levels at Loyola College, he was subsequently graduated with a Bachelor of Science degree in Mathematics from The New College. He later became a bodybuilder and earned the "Mr. Madras University" title in 1974. He then moved to Bangalore to work for the newly started Tamil newspaper Dinakaran, he started as a cycle boy distributing newspapers to shops and later graduated to become a reporter for the same newspaper. After successfully establishing the circulation, he moved on to Chennai. He shifted his energies towards running his own business, a travel agency in Chennai and meeting Kalaivanan Kannadasan who elevated him to become a producer. Sarathkumar made his acting debut in 1986, in the Telugu film Samajamlo Sthree at the behest of a producer friend. In 1988, while running his travel agency in Chennai, Sarathkumar got an opportunity to act as well as produce in the Tamil film Kan Simittum Neram. The film was directed by Kalaivanan Kannadasan and he co-starred with Karthik and Ambika. In 1989, R. Sarathkumar was spotted by Raju, the personal make-up man of actor Vijayakanth, who recommended him to the Pulan Visaranai's team. Finally, R. Sarathkumar acted as a villain in Pulan Visaranai and the film turned out to be a blockbuster. He won a Cinema Express Award for Best Villain for his role, which brought him more film offers. In 1990, he teamed up for the second time with Kalaivanan Kannadasan for the film Mr. Karthik, which flopped at the box office. Thereafter, he appeared in antagonist roles in Tamil films such as Pudhu Padagan, Velai Kidaichuduchu, Raja Kaiya Vacha, Enkitta Mothathe, Jagathalaprathapan and in Telugu films such as Vishnu, Magaadu and Balachandrudu. He acted in few Tamil films in supporting roles such as Salem Vishnu, Sirayil Sila Raagangal, Mounam Sammadham and Puriyaadha Pudhir. Puriyaadha Pudhir marked the first collaboration with Sarathkumar and director K. S. Ravikumar. He also acted in his first venture as a hero in Palaivana Paravaigal under Senthilnathan's direction, who at that time gave consecutive hits. In 1991, he acted in twelve Tamil films and three Telugu films, mostly in supporting roles and four films in lead roles, but he continued to act in few films as a villain. In the start of 1991, he acted in negative roles in the Telugu film Stuartpuram Police Station, starring Chiranjeevi and Vijayashanti, Namma Ooru Mariamma, Vetri Padigal and Pudhu Manithan. He acted as a retired military officer in Chithirai Pookkal and played the second hero role in the blockbuster film Captain Prabhakaran. In May 1991, he appeared in lead roles in Senthilnathan's Kaaval Nilayam and K. S. Ravikumar's rural drama film Cheran Pandiyan, and starred as Chiranjeevi's brother in the Telugu film Gang Leader, the three were commercially successful. In July 1991, he acted in Archana IAS, co-starring Sithara and acted in the role of the father Vaidehi Kalyanam. At the end of 1991, he played a small role in the Telugu film Surya IPS, a negative role in Pavithran's Vasanthakala Paravai and starred in a lead role in Senthinathan's Thangamana Thangachi. In 1992, he has acted in 10 films as protagonist and 2 films as antagonist including the Telugu film Agreement, directed by Manivannan and P. C. Sreeram's Meera. In the beginning of 1992, he acted in Senthilnathan's Ilavarasan, alongside Sukanya, Manivasagam's Periya Gounder Ponnu and Sivandha Malar. In mid-1992, he worked in K. S. Ravikumar's Oor Mariyadhai, co-starring Sasikala and in Senthilnathan's Idhuthanda Sattam. He then starred in the action film Suriyan, directed by Pavithran and it became his first big break. The film won positive reviews and became highly successful at the box office; he received a Cinema Express Award Best Actor Special Award for the role in which he shaved his head. Subsequently, Sarathkumar was catapulted to fame, his fan base was growing exponentially and he became selective in accepting new assignments. Soon, he was in competition with "Puratchi Kalaignar" Vijayakanth. In the end of 1992, he acted in the action film Thai Mozhi, co-starring Vijayakanth and Mohini, Ellaichami, Manoj Kumar's Samundi and Senthilnathan's Natchathira Nayagan, making their fifth and last collaboration. Thai Mozhi was released to mixed reviews and Samundi, despite unfavourable reviews, managed to run for more than 100 days. In the start of 1993, he acted in Aadhityan, co-starring Sukanya and Pandiarajan and in Dasarathan, produced by Mani Ratnam and S. Sriram. Aadhityan was released to negative reviews, while the much-hyped Dasarathan failed at the box office. In mid-1993, he starred in Suresh Krissna's Vedan, co-starring Kushboo, in Munarivippu alongside Heera Rajagopal and in his fourth collaboration with director K. S. Ravikumar; Band Master, again with Heera Rajagopal and Ranjitha. Band Masterreleased to negative reviews, whereas Munarivippu was well received critically. In the end of 1993, he acted in the thriller film Moondravadhu Kann, he teamed up with the Suriyan team (consisting of director Pavithran, cinematographer Ashok Kumar, comedian Goundamani, villain Babu Antony and the editor duo B. Lenin and V. T. Vijayan) for the second time in I Love India and worked in the comedy film Kattabomman. Moondravadhu Kann was a hit at the box office and Kattabomman was labelled as a "disaster", but Malini Mannath of The New Indian Express stated that "Sarath seems to have improved on his expressions". His 1992 Telugu film Agreement was dubbed into Tamil as Idhayam Ullavan and fetched highly negative reviews upon release. Malini Mannath criticised his choice of scripts and films. That year, Sarathkumar could not accept the lead role in Shankar's Gentleman because he was busy with other projects and was subsequently replaced by Arjun Sarja. The film turned out be a blockbuster and Sarathkumar missed the chance to consolidate his position. In the start of 1994, he worked in Aranmanai Kaavalan and in the bilingual Tamil/Telugu film Captain, directed by Kodi Ramakrishna. Aranmanai Kaavalan was released to positive reviews while Captain was released to largely negative reviews and failed at the box office. In mid-1994, he played three roles in Namma Annachi and in Manoj Kumar's masala film Raja Pandi, he played a cameo appearance, as himself in the comedy film Killadi Mappillai and he appeared in a guest role for Pavithran's film Indhu. Namma Annachi and Rajapandi were released to unfavourable reviews. K. Vijiyan of New Straits Times stated for Namma Annachi: "to do all three roles is just to generate more publicity for Sarath and the movie". His next venture was K. S. Ravikumar's Nattamai, alongside Meena and Kushboo, in which he played a dual role. The film became a blockbuster and achieved cult status. His performance was highly praised by critics and also fetched him several notable awards, including Tamil Nadu State Film Award for Best Actor, Filmfare Award for Best Actor and Cinema Express Award for Best Actor. It was followed by Magudikkaran in which he appeared in a guest appearance. After the failure of Captain and the success of Nattamai, R. Sarathkumar decided to focus only on Tamil cinema. The next year, he worked in the village drama Veluchami, P. Vasu's Coolie, Nadodi Mannan and the crime film Ragasiya Police. Veluchami opened to favourable reviews with K. Vijiyan of New Straits Times claiming that "Sarathkumar shows more maturity with his acting". The four films were commercial failures. In 1996, he acted in A. Venkatesh's first film Mahaprabhu. The film turned out to be a hit. He then starred in the action film Nethaji, alongside Lisa Ray; the film was a failure at the box office. In 1997, he acted in Aravindhan, co-starring R. Parthiepan, Nagma and Urvashi. The film failed at the box office. His next venture Suryavamsam, directed by Vikraman and produced by R. B. Choudary was a blockbuster. He played a dual role in the film. He won the Filmfare Award for Best Actor in Tamil and Cinema Express Award for Best Actor for the second time. In the end of 1997, he acted in the Sundar C. comedy film Janakiraman which was a commercial hit. The next year, he played in Moovendhar, directed by Suraj, Sundar C's assistant director. The film, released to negative reviews, failed at the box office. After Nattamai, he re-teamed with K. S. Ravikumar in Natpukkaga, the film was well received critically and turned out to be a blockbuster. R. Sarathkumar won the Filmfare Award for Best Actor for the third time and the Tamil Nadu State Film Award for Best Actor for the second time. He made a cameo appearance in Vikraman's Unnidathil Ennai Koduthen. He then starred in the Telugu film Preminchanu Nene and in Simmarasi, directed by Erode Soundar, K. S. Ravikumar's former dialogue writer. Simmarasi was released to unfavourable reviews, but Sarathkumar was praised for his role. In the start of 1999, he acted in R. Chandra's Chinna Durai, co-starring with Roja. It was followed by Oruvan, the remake of the Telugu film Auto Driver, in which Sarathkumar paired with Pooja Batra and teamed up for the second time with the director Suresh Krissna. Usha Gopalakrishnan of indolink.com praised Sarathkumar's acting. In the end of 1999, he acted in K. S. Ravikumar's Paattali. In 2000, he starred in Super Good Films, Maayi and made a guest appearance in Pennin Manathai Thottu. Despite facing controversy, Maayi proved to be successful at the box office with a reviewer citing that "In the title role of a totally underplayed character, Sarathkumar surely makes a mark". In the start of 2001, he acted in the action film Rishi and went on to appear as himself in Ullam Kollai Poguthae, both directed by Sundar C. He co-starred with Vikram in Vinnukum Mannukum, directed by Rajakumaran and produced by R. B. Choudary. The film, released after many troubles and eventually failed at the box office. He then acted in S. A. Chandrasekhar's Dosth. His next release was K. S. Ravikumar's family drama Samudhiram; he acted alongside Murali and Manoj Bharathiraja. Despite negative reviews, the film was a commercial success. The next year, he appeared in Thenkasi Pattanam, alongside Napoleon and Samasthanam, alongside Malayalam actor Suresh Gopi, both were two hero-subjects. Sarathkumar's first 2003 release was Arasu, directed by Suresh, and the film was a super-hit at the box office. However, his second film Paarai, a remake of the Malayalam film Mahayanam, directed by K. S. Ravikumar was an average grosser. His third film was Diwan, directed by Suryaprakash, who previously directed the successful Maayi. His performance was praised by critics. In the start of 2004, he acted in the action films Chatrapathy and Gambeeram; both were average grosser. In the making for the last five years, Maanasthan was released to average reviews. His next venture Aai, in which he co-starred with Namitha and Vadivelu, an action masala film, directed by A. Venkatesh, was a decent hit. He was also introduced as a playback singer in Aai. In 2005, he starred in Hari's Ayya, alongside newcomer Nayanthara. The film was released on the Pongal weekend to positive reviews and was a super hit at the box office. Sarathkumar's performance fetched very positive reviews with a reviewer citing: "another splendid performance from Sarathkumar". He appeared in guest appearances in the Telugu film Bunny and his wife's production Githan. The success of A. Venkatesh's Aai resulted in the film's team collaborating to make a film in a similar genre, Chanakya, which also featured Namitha and Vadivelu. The film was a hit at the box office, and marked the A. Venkatesh and Sarathkumar combination's third hit in a row. He signed up for Khaki and shooting was in progress. Sarathkumar even tonsured his head for the film, but the film was dropped for some reason. In 2006, he directed and acted in his 100th film Thalaimagan, produced by his wife Raadhika under the "Radaan Media works" banner. The film failed at the box office. The next year, he starred in Gautham Menon's Pachaikili Muthucharam, which released to positive reviews, but ended up as an average grosser. A critic stated his performance: "as a next-door-family-man, Sarathkumar has excelled". Sarathkumar signed up for a Malayalam film, Vaitheeswaran, 1977 and a film directed by K. S. Ravikumar. He then played a cameo appearance as himself in Cheran's Maya Kannadi. Sarathkumar's last 2007 release was Nam Naadu, a remake of the Malayalam hit Lion, marking his third collaboration with director Suresh. This was his first film after he launched his own political party in Tamil Nadu. The film, released to largely negative reviews, failed at the box office. In 2008, his only release was the supernatural film Vaitheeswaran, which was released to negative reviews. In the start of 2009, he acted in the film 1977, donning six different looks. The film, made with a whopping budget of 15 crores, was directed and produced by newcomer G. N. Dinesh Kumar. The film, which released to negative reviews, took an average opening and was declared a flop at the box office. In October 2009, Sarathkumar made his debut in Malayalam through Pazhassi Raja, in which he co-starred with Mammootty and he played the role of Edachena Kunkan. The historical period film was directed by Hariharan. For the film, Sarathkumar won the Vanitha Film Awards for Best Supporting Actor. After the release of Pazhassi Raja, Sarathkumar was flooded with offers in Malayalam. Jaggubhai was released on 29 January 2010, the film, directed by K. S. Ravikumar, became the tenth collaboration between the director and the actor. The film, facing serious piracy problems before its release, bombed ultimately at the box office. He then made a guest appearance in Madhumitha's comedy film Kola Kolaya Mundhirika. In the end of 2010, he acted in the Malayalam film Oridathoru Postman, which was a flop at the box office. In early 2010, he acted in his first Malayalam film The Metro as a solo hero, which bombed at the Kerala box office. He appeared in Christian Brothers, directed by Joshiy, starring alongside Mohanlal, Dileep, and Suresh Gopi. The film was a blockbuster. In mid-2011, Sarathkumar played the role of a transgender person in Raghava Lawrence's Muni 2: Kanchana. The film became a commercial success in both Tamil and Telugu, he won for his performance a Vijay Award for Best Supporting Actor. In early 2012, he accepted Soundarya's offer for an important role in the film Kochadaiiyaan, starring Rajinikanth and Deepika Padukone. He played lead role in the Malayalam film Achante Aanmakkal as an IPS officer. He then starred in his first Kannada film Saarathi, which was a blockbuster, followed by the Telugu film Genius. The next year, he played the role of a police officer in the Kannada film Myna. His next venture was Chennaiyil Oru Naal, a remake of the Malayalam hit film Traffic and co-produced by his wife Raadhika Sarathkumar, in which he played the role of a traffic police commissioner. The film became a critical and commercial success. He then appeared in the Telugu film Chandee, playing the role of a police officer. In the beginning of 2014, he played the role of a CBI officer in Nimirndhu Nil and Janda Pai Kapiraju, which were shot simultaneously in Tamil and Telugu. He then appeared in "India's first photorealistic performance capture film" Kochadaiiyaan, co-starring Rajinikanth and Deepika Padukone. The film is followed by Malayalam film, Asha Black and was simultaneously released in Tamil as Nee Naan Nizhal. In his early days as an actor, R. Sarathkumar was considered to be close to All India Anna Dravida Munnetra Kazhagam (AIADMK) supremo Jayalalithaa. However, Sarath's proximity to Jayalalithaa landed him in deep trouble when the film Nattamai, which was still running in Tamil Nadu theatres, was aired by Jayalalithaa's television channel JJ TV, using a videotape, which Sarathkumar gave her for personal viewing at her residence. However, this caused a furore in the film industry as the producer R. B. Choudary threatened action against Sarathkumar for misusing a tape given to him for personal viewing. An embarrassed Sarathkumar explained that he was taken by surprise and that he never expected Jayalalithaa to give it to the channel for the telecast. He sought an explanation from both Jayalalitha and JJ TV, but without success. The ruling party reacted predictably, using every forum to attack Sarathkumar. He, in turn, realising that the public was behind him, announced his decision to join hands with Rajinikanth, who supported the Dravida Munnetra Kazhagam (DMK) – Tamil Maanila Congress (TMC) alliance. In 1996, Sarath Kumar entered politics, joining the Dravida Munnetra Kazhagam (DMK). In 1998, the DMK's leader Karunanidhi asked Sarathkumar to contest the Lok Sabha elections from Tirunelveli. In the election, DMK lost very badly and the alliance could muster only 9 seats compared to the 39 seats it swept in 1996. Even though DMK lost badly in many constituencies, Sarathkumar was defeated by the AIADMK candidate Kadambur R. Janarthanan by a margin of only 6904 votes. In July 2001, the party made him a Rajya Sabha member, but he resigned before the 2006 Assembly elections to join the AIADMK along with his wife Raadhika. In October 2006, his wife Radhika was dismissed from AIADMK for anti-party activities. He also quit AIADMK in November 2006, quoting that his role as president of the South Indian Artistes' Association needed "undivided attention". Sarathkumar launched his own political party the All India Samathuva Makkal Katchi on 31 August 2007. Sarathkumar said: "We are disillusioned by the Dravidian parties, which had done little to develop the state despite being in power for four decades". Just before 2011 Assembly elections, Sarathkumar joined the AIADMK alliance and his party was allotted two seats. His party contested as part of the AIADMK alliance and won in two assembly constituencies – Tenkasi and Nanguneri. Sarathkumar won from Tenkasi and Ernavur A. Narayanan won from Nanguneri. In January 2016, Ernavur A. Narayanan has been expelled from the party for not abiding by the party rules and indulging in anti-party activities. In the 2016 Assembly elections, Sarath Kumar lost in Tiruchendur Constituency to DMK Candidate Anitha R. Radhakrishnan. In November 2017, Sarathkumar said in an interview for The Hindu : "For the last 10 years, I have been closely associated with AIADMK. In fact, I have even been identified as the party’s propaganda secretary. Though I don’t regret this identification, my party couldn’t grow. Now, I want to focus on my party and be seen as a possible Chief Minister candidate". After finishing his studies, Sarathkumar started out as a newspaper boy, managing newspaper circulation before moving on to become a reporter. After establishing Dinakaran in Bangalore, he was called to Chennai to expand their business there. Sarathkumar is now the founder and editor of Media Voice weekly magazine in Tamil. One of the key value propositions that Media Voice brings to the table is Sarath's personal interview each month with a news-maker discussing current issues. "Although I am a politician and actor now, the journalist in me is still alive. I love multitasking", said Sarath. The Hindu states: From such humble beginnings, he has learnt to live an inspired life, and is the strong leader that society needs. Sarathkumar with his wife Raadhika at the 62nd Filmfare Awards South in 2015. R. Sarathkumar has been married twice. His first marriage was to Chaya in 1984 and the couple had two daughters, Varalaxmi (born 1985) and Pooja (born 1987). In the mid-1990s,Sarathkumar was involved in a relationship with actress Nagma, with whom he paired in films such as Ragasiya Police, Aravindhan and Janakiraman. After knowing of their relationship, Chaya filed a divorce petition.Sarathkumar and Chaya got divorced in 2000. Then Sarathkumar got married with actress Raadhika on 4 February 2001. They were friends when they worked together in Kargil, they also paired in two films: Namma Annachi and Suryavamsam. The couple has a son named Rahul born in 2004. He has also a stepdaughter named Rayanne Hardy born to his wife Raadhika with her ex-husband Richard Hardy in 1992. His elder daughter Varalaxmi works in the South Indian cinema industry as actress. His stepdaughter Rayanne Hardy got married with cricketer Abhimanyu Mithun on 28 August 2016. ^ a b "Sarath kumar celebrates 54th birthday". IndiaGlitz. 15 July 2008. Retrieved 17 June 2011. ^ a b T. Saravanan (23 November 2012). "Sarath Speak". The Hindu. Retrieved 4 January 2014. ^ a b T. Saravanan (22 November 2012). "Speaks his mind". The Hindu. Retrieved 4 January 2014. ^ NK, Jarshad (6 February 2013). "For south Indian movie stars, the glitter is in their title". The Economic Times. Retrieved 4 January 2014. ^ a b "Actor Sarath Kumar launches own party". The Indian Express. 1 September 2007. Retrieved 4 January 2014. ^ "Sarath Kumar's hat trick". sify.com. 1 June 2012. Retrieved 4 January 2014. ^ "Cine Biography Supreme Star Sarath Kumar (Part-1)". dinakaran.com. Archived from the original on 10 February 2001. Retrieved 21 November 2016. ^ a b c d e "About the Leader — AISMK". aismk.in. Retrieved 4 January 2014. ^ "Sarathkumar bereaved". The Hindu. 27 October 2013. Retrieved 4 January 2014. ^ "Call him Dr K S Ravikumar". indiaglitz.com. 12 November 2009. Retrieved 20 August 2013. ^ a b c d e f g h i "More about Sarath Kumar". bizhat.com. Retrieved 11 January 2014. ^ a b Malini Mannath (1 January 1993). "Run-of-the-mill fare". The Indian Express: 7. Retrieved 21 September 2013. ^ Ayyappa Prasad (30 October 1992). "Of film gods, devotees and the rage". The Indian Express: 7. Retrieved 8 October 2013. ^ Malini Mannath (23 October 1993). "Thrilling but lacks punch". The Indian Express: 7. Retrieved 8 October 2013. ^ Malini Mannath (25 September 1993). "Rings a bell". The Indian Express: 7. Retrieved 21 September 2013. ^ Malini Mannath (22 January 1993). "Puerile yarn". The Indian Express: 7. Retrieved 21 September 2013. ^ "Actor with many hats to wear". The Hindu. 23 September 2005. Retrieved 8 October 2013. ^ Malini Mannath (7 May 1993). "All gloss, no stuff". The Indian Express: 7. Retrieved 21 September 2013. ^ Malini Mannath (18 June 1993). "Surprise, without notice". The Indian Express: 6. Retrieved 21 September 2013. ^ a b Balaji Balasubramaniam. "ORUVAN". bbthots.com. Retrieved 21 September 2013. ^ Malini Mannath (9 July 1993). "Nothing to crow about". The Indian Express: 6. Retrieved 21 September 2013. ^ "Manivannan Successive hits — Who gave the most in Tamil cinema? - Behindwoods.com". behindwoods.com. Retrieved 21 September 2013. ^ Malini Mannath (12 November 1993). "Best left unseen". The Indian Express: 6. Retrieved 21 September 2013. ^ K. Vijiyan (16 October 1993). "Bogged down with too many songs". New Straits Times: 28. Retrieved 28 August 2013. ^ K. Vijiyan (14 August 1993). "Catchy songs pep up Gentlemen's story". New Straits Times: 25. Retrieved 8 October 2013. ^ Malini Mannath (10 December 1993). "Festival's flops and surprises". The Indian Express: 6. Retrieved 21 September 2013. ^ Malini Mannath (25 February 1994). "What a surprise!". The Indian Express: 6. Retrieved 22 August 2013. ^ Malini Mannath (4 March 1994). "Jerky, insipid". The Indian Express: 6. Retrieved 22 August 2013. ^ K. Vijiyan (25 June 1994). "Triple role just to generate publicity". New Straits Times: 24. Retrieved 28 August 2013. ^ Malini Mannath (16 September 1994). "Hostage of revenge". The Indian Express: 6. Retrieved 28 August 2013. ^ Malini Mannath (11 November 1994). "Just end". The Indian Express: 6. Retrieved 28 August 2013. ^ "Top 7 Village Panchayat Presidents of Tamil cinema — Behindwoods.com". behindwoods.com. 23 May 2009. Retrieved 29 August 2013. ^ K. Vijiyan (4 February 1995). "Good acting, pretty face in Sarath Kumar's latest". New Straits Times: 24. Retrieved 21 September 2013. ^ "Tamil Movie News—1995 Review". groups.google.com. 9 January 1996. Retrieved 20 August 2013. ^ S. R. Ashok Kumar (25 May 2013). "Audio Beat: Summa Nachunu Irukku". The Hindu. Retrieved 21 August 2013. ^ "A-Z (I) – INDOlink". indolink.com. Archived from the original on 31 March 2009. Retrieved 20 August 2013. ^ "Cinema Express awards presented". indianexpress.com. 11 August 1998. Retrieved 24 January 2014. ^ Nikhil Raghavan (20 March 2011). "The Hindu : Cinema Plus / Columns : ITSY-BITSY". The Hindu. Retrieved 20 August 2013. ^ K. Vijiyan (28 December 1998). "Bumper year for Tamil movies". New Straits Times: 4. Retrieved 11 January 2014. ^ Simma Rasi: Movie Review Archived 9 June 2012 at the Wayback Machine. Indolink.com. Retrieved on 8 April 2014. ^ Radha Venkatesan (19 March 2000). "The Hindu : PT threatens stir against 'Maayi'". The Hindu. Retrieved 10 January 2014. ^ "Vinnukkum Mannukkum". cinematoday2.itgo.com. Retrieved 20 August 2013. ^ Samuthiram – Tamil Movie Review. Thiraipadam.com. Retrieved on 8 April 2014. ^ Malathi Rangarajan (12 March 2004). "The Hindu : Gambeeram". The Hindu. Retrieved 21 August 2013. ^ "Sarath Kumar celebrates". rediff.com. 28 June 2003. Retrieved 21 August 2013. ^ "AllIndianSite.com — Diwan — It's All About movie". kollywood.allindiansite.com. Archived from the original on 31 October 2004. Retrieved 21 August 2013. ^ "Tamil box office March update!". sify.com. 15 March 2004. Retrieved 21 August 2013. ^ Movie Review : Manasthan. Sify.com. Retrieved on 8 April 2014. ^ "'Aei' success meet in Chennai!". sify.com. 25 December 2004. Retrieved 21 August 2013. ^ "rediff.com: Pongal Releases, 2005". rediff.com. 14 January 2005. Retrieved 21 August 2013. ^ "Sarath Kumar — Top 20 actors of Kollywood — Behindwoods.com". behindwoods.com. 14 January 2005. Retrieved 21 August 2013. ^ "The best of reel politics — Behindwoods.com". behindwoods.com. 16 May 2009. Retrieved 29 August 2013. ^ "Ayya Review — Tamil Movie Review — Now Running". nowrunning.com. 12 January 2005. Retrieved 21 August 2013. ^ "Tamil box office March update!". sify.com. 25 September 2005. Retrieved 21 August 2013. ^ "Sarathkumar's lucky mascot is Venkatesh". behindwoods.com. 29 November 2005. Retrieved 23 August 2013. ^ "Sarath Kumar revives Khaki". oneindia.in. 31 March 2008. Retrieved 21 August 2013. ^ "Pachaikili Muthucharam Review — Tamil Movie Review — Now Running". nowrunning.com. 16 February 2007. Retrieved 21 August 2013. ^ S.R. Ashok Kumar (16 February 2007). "I don't have time for politics now". The Hindu. Retrieved 21 August 2013. ^ Malathi Rangarajan (21 March 2008). "Speak less, please! – Vaitheeswaran". The Hindu. Retrieved 21 August 2013. ^ "'1977' with 15 crores". supergoodmovies.com. Archived from the original on 15 September 2014. Retrieved 21 August 2013. ^ "1977 Review — Behindwoods.com". behindwoods.com. Retrieved 21 August 2013. ^ Malathi Rangarajan (10 March 2009). "Chennai Box Office: March 6–8, 2009". sify.com. Retrieved 21 August 2013. ^ "2009– Kollywood Hits & Misses!". sify.com. 31 December 2009. Retrieved 21 August 2013. ^ "Sarath, Mammootty to act in Malayalam film". articles.timesofindia.indiatimes.com. 17 June 2008. Retrieved 21 August 2013. ^ "Sarath-Radhika in tears: Stars support". indiaglitz.com. 5 January 2010. Retrieved 22 August 2013. ^ "Re 'Koll' of 2010 Hits and Flops — Exclusive". tamil.way2movies.com. 3 January 2011. Retrieved 22 August 2013. ^ "Meera Nandan regrets film choices". newindianexpress.com. 10 December 2010. Retrieved 22 August 2013. ^ a b "Sarathkumar is still hot in Malayalam!". sify.com. 9 February 2011. Retrieved 22 August 2013. ^ "A multi starrer film 'Christian Brothers'". myfirstshow.com. Retrieved 22 August 2013. ^ "Lawrence's Kanchana strikes gold". sify.com. 2 August 2011. Retrieved 22 August 2013. ^ "2011: Success rate of Kannada films increased". ibnlive.in.com. 29 December 2011. Retrieved 22 August 2013. ^ Balraj Tantri (21 February 2013). "Interview — Mynaa is based on a real-life incident: Nagashekar". oneindia.in. Retrieved 23 August 2013. ^ "Chennaiyil Oru Naal, a success". articles.timesofindia.indiatimes.com. 4 April 2013. Retrieved 23 August 2013. ^ "'Chandi' review: Disappointing revenge drama". Deccan Chronicle. 10 November 2013. Retrieved 15 September 2014. ^ "Movie Review : Nimirnthu Nil". sify.com. Retrieved 15 September 2014. ^ "Jenda Pai Kapiraju postponed again?". The Times of India. 3 August 2014. Retrieved 15 September 2014. ^ "'Kochadaiyaan' Must be Viewed as Animated Film, Warns Ravikumar". The New Indian Express. 11 March 2014. Retrieved 15 September 2014. ^ "Star wars". India Today. 31 October 1995. Retrieved 12 January 2014. ^ G. C. Shekhar (31 December 1995). "Jayalalitha's unlucky stars". India Today. Retrieved 12 January 2014. ^ "Sarath Kumar quits DMK". sify.com. 11 April 2006. Retrieved 12 January 2014. ^ M.L., Ahuja. "On the Campaign Trail". Electoral Politics and General Elections in India, 1952–1998. Mittal Publications. p. 301. ISBN 978-8-170-99711-5. ^ "Elections 98". rediff.com. Retrieved 2 February 2014. ^ Arun Ram (11 April 2006). "Starry blow to DMK, Sarath Kumar joins AIADMK". Daily News and Analysis. Retrieved 12 January 2014. ^ V. Jayanth (20 April 2006). "Sarath Kumar, Radhika face different problems". The Hindu. Retrieved 12 January 2014. ^ V. Jayanth (7 November 2006). "Sarath Kumar quits AIADMK". The Hindu. Retrieved 12 January 2014. ^ Sarath Kumar’s party gets two seats in AIADMK alliance. The Hindu (10 March 2011). Retrieved on 8 April 2014. ^ "Tamil Nadu / Chennai News : Jayalalithaa establishes direct contact with leaders of AIADMK alliance". The Hindu. 19 March 2011. Retrieved 29 November 2012. ^ Tenkasi constituency election results 2011 : Sarath Kumar R of AISMK WINS – Tamil Nadu. NewsReporter.in (13 May 2011). Retrieved on 8 April 2014. ^ "Sarath Kumar expels party MLA Ernavur Narayanan". The Hindu. 28 January 2016. Retrieved 21 November 2016. ^ a b "Tamil Nadu Assembly elections 2016: Tamil film action heroes lose out". The Hindu. 19 May 2016. Retrieved 21 November 2016. ^ "Want to be seen as possible CM candidate: Sarathkumar". The Hindu. 16 November 2017. Retrieved 14 August 2018. ^ "STATISTICAL REPORT ON GENERAL ELECTIONS, 1998 TO THE 12th LOK SABHA" (PDF). Election Commission of India. Archived from the original (PDF) on 18 July 2014. Retrieved 21 November 2016. ^ "Tenkasi Assembly Election 2011, Tamil Nadu". empoweringindia.org. Retrieved 21 November 2016. ^ "Tamil celebrities who married more than once". The Times of India. 16 July 2015. Retrieved 25 November 2016. ^ "Sarathkumar And Chaya Got Divorced". pellipetakulu.com. Retrieved 25 November 2016. ^ "Tamil Movie News: March edition". dinakaran.com. Archived from the original on 30 April 2016. Retrieved 25 November 2016. ^ "Tamil Movies : "Want your money back? Ask Nagma not me!"". behindwoods.com. 19 July 2009. Retrieved 25 November 2016. ^ "Marquee News from Kodambakkam". chandrag.tripod.com. Retrieved 25 November 2016. ^ "Tamil actress Nagma". movies.bizhat.com. Retrieved 25 November 2016. ^ "Bollywood has double standards". The Times of India. 12 February 2012. Retrieved 25 November 2016. ^ "Sarath: Radhika's Next Groom!". cinematoday2.itgo.com. Retrieved 4 January 2014. 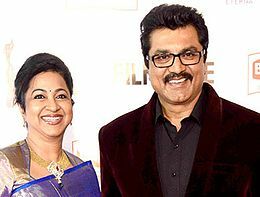 ^ "Sarathkumar-Radikaa celebrate 10th wedding anniversary!". kollyinsider.com. 8 February 2011. Retrieved 4 January 2014. ^ "Surprise party for a loving couple". filmibeat.com. 22 January 2015. Retrieved 25 November 2016. ^ Malathi Rangarajan (31 December 2004). "The Hindu : Entertainment / Interview : Managing a mega show". The Hindu. Retrieved 4 January 2014. ^ S. R. Ashok Kumar (6 July 2004). "The Hindu : `I bully you a lot more now'". The Hindu. Retrieved 4 January 2014. ^ "Varalaxmi celebrates in Andaman". The Times of India. 5 March 2013. Retrieved 25 November 2016. ^ "Raadhika Sarathkumar's daughter Rayane marries Abhimanyu Mithun". International Business Times. 29 August 2016. Retrieved 25 November 2016. ^ "Raadhika Sarathkumar's daughter Rayane and cricketer Abhimanyu tie the knot". The News Minute. 28 August 2016. Retrieved 25 November 2016. ^ a b c d "Sarath Kumar". indiafilm.com. Archived from the original on 30 August 2009. Retrieved 2 February 2014. ^ a b c d e "AISMK — Awards". aismktuticorin.in. Archived from the original on 15 August 2014. Retrieved 2 February 2014. ^ "Cinema Express awards presented". expressindia.indianexpress.com. Retrieved 2 February 2014. ^ "Meena wins award for best actress". rediff.com. Retrieved 2 February 2014. ^ "DINAKARAN CINEMA AWARD – 1997". dinakaran.com. Archived from the original on 1 July 2008. Retrieved 2 February 2014. ^ "Awards For Sarath Kumar & Meena". dinakaran.com. Archived from the original on 22 June 2008. Retrieved 27 December 2014. ^ "Bharat Cine Awards (MGR Sivaji Awards)". indiaglitz.com. 2 January 2006. Retrieved 2 February 2014. ^ "MGR Sivaji Awards — A Star Studded Event". indiaglitz.com. 2 January 2007. Retrieved 2 February 2014. ^ "'Pazhassi Raja' selected as best film". The Hindu. 4 January 2010. Retrieved 2 February 2014. ^ Vanitha film awards 2009 announced. Keral TV. Retrieved 11 February 2010. ^ "Sathyan memorial film awards announced". The Hindu. 13 January 2010. Retrieved 2 February 2014. ^ "Jai Hind film awards announced". The Hindu. 20 July 2010. Retrieved 2 February 2014. ^ "MATHRUBHUMI AMRITA FILM AWARDS, 2010". amritatv.com. Archived from the original on 16 December 2012. Retrieved 2 February 2014. ^ "SIIMA AWARDS: 2011 WINNERS". siima.in. Archived from the original on 23 February 2014. Retrieved 2 February 2014. ^ "6th Annual Vijay Awards: Kamal, ARR & top celebs grace the occasion". indiaglitz.com. 18 June 2012. Retrieved 2 February 2014. ^ "Awards Chennai Dost". chennaidost.com. Archived from the original on 20 February 2014. Retrieved 2 February 2014. ^ "Norway Tamil Film Festival — Tamilar Awards for the year 2013". ntff.no. 2 May 2013. Retrieved 21 November 2016. Wikimedia Commons has media related to R. Sarathkumar.